This is a drawing of an anatomical preparation in the collection of Utrecht's Museum Bleulandinum created by Frederick Ruysch (1638-1731) of Amsterdam, a multi-talented man who was perhaps the finest anatomist of the late 17th and early 18th centuries. Ruysch's creations were much sought after for their artistry. Czar Peter I of Russia first visited Ruysch in 1697. Ruysch and Peter the Great shared many interests, and Ruysch even taught Czar Peter how to extract teeth (which became something of a hobby for him). In 1717, Peter the Great purchased 100 pieces of Ruysch's work for his own collection, though the delivery was somewhat delayed by Ruysch's reluctance to help pack the specimens and the onset of the Great Nordic War. 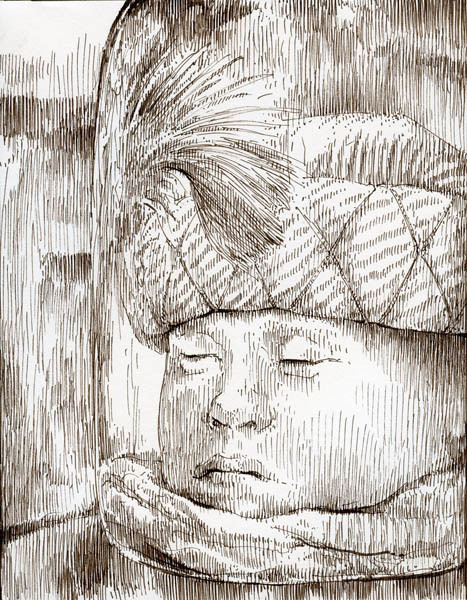 This particular piece is a child's head dressed up in a feathered turban (the "Turkish cap" referenced in the title). Its creation dates to between 1705 and 1715, so may already have been in another collector's hands before Peter the Great came calling. But why is it? What important medical discovery is here preserved? Clearly, that was not the point. The ability of children (even Turkish children) to wear hats has long been understood. I believe this was really a case of Ruysch creating a purely exotic curio. The child's head was just an excuse to show off the hat. This was a time in which Europe was coming into ever greater contact with the east — especially as the mighty Ottoman Empire continued to expand and exert pressure on the west's large commercial economies, of which Holland was in the forefront. Dutch artists and scientists of Ruysch's day were as interested in Turkish culture as those of the 19th century would become infatuated by the Japanese. So, this example of strange oriental headgear would have been very interesting to Ruysch's audience.